Today’s #TipTuesday post is a simple one, and it’s about user notifications. 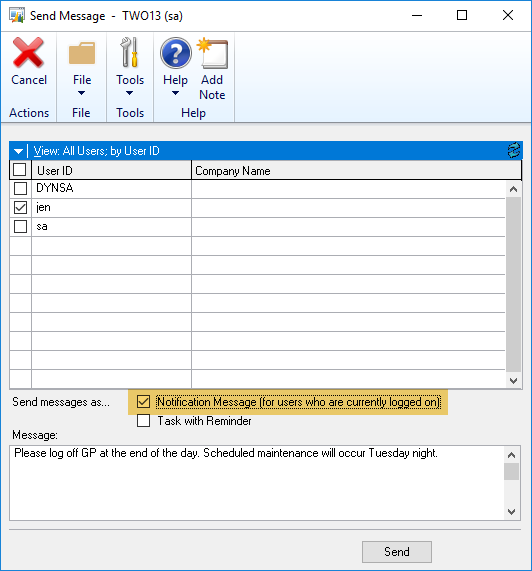 In GP 2013 R2, the “Send Users Message” feature was introduced as an easy way to send a notification to users who are logged in or to add a task to users’ reminder list in Dynamics GP. This feature is under the Administration page > Utilities > System > Send Users Message. 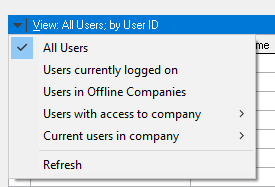 The default view option is “All Users”, as shown in this screenshot. Simply mark the users you want to send a message to, select one or both of the options beside “Send messages as…”, type a message and click Send. In this example, I am sending a Notification Message, which is a pop-up message for all logged-in users. Only users who are logged in when you click on Send will receive this type of notification. Depending on the scenario, for instance some maintenance you are about to do, this may be exactly what you want to do, as users not logged in don’t need the notification. This set of options allows you to fine-tune the choice of users a bit more. There are many good options here such as only sending a note to currently-logged-in user of a specific company, if you were doing something that impacted only one GP company; and an option to just all users logged in, regardless of company. In reality, if using the Notification Message option, “All Users” and “Users currently logged on” will have the same result. If you are using the Task with Reminder option though, the distinction of which you want will be important. Overall, it’s a small utility but useful when all you want is to easily notify your users to log of GP for a specific reason, vs. other alternatives that are outside of GP. Using GP2018, the Notification Message …box is greyed out and I am unable to check it even if trying to message just one user at a time. Any ideas on how to make this active? Hi again Gary, sorry for the delayed response! I just tested with my test GP 2018 installation and it’s not greyed out. I tested with both ‘sa’ and a user that only has a basic GP role (but still has access to that window) and in both cases the box is still enabled. I would suggest starting a discussion on either the Dynamics Community forum or GPUG Open Forum (or reach out to your partner)? Gary: I’ll test and let you know.